We hope you never need the nine airbags that come standard in every SUPERB Wagon. Located at the front, front side, rear side, curtain, and driver's knee area, they help protect you and your loved ones in the event of a collision. The SUPERB Wagon is designed to be seen — during the day, and at night. Innovative lighting systems, including front headlights fitted with Bi-Xenon technology, Adaptive Frontlight System (AFS), and LED daytime running lights, ensure you can see and be seen, at all times. The rear features striking LED lights and two reflectors on each side of the rear bumper, included as standard. Some forward thinking for when you’re going backwards. A rear view camera◊** helps you back out of your driveway with peace of mind and tackle those tricky reverse parks with confidence. Sometimes you just need your space. 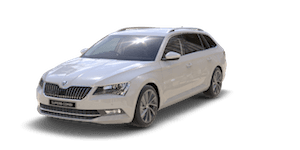 The SUPERB Wagon offers ample room in all directions for you and your passengers. Specifically, the interior offers 1507mm in width, with 995mm of headroom for the driver and front passenger. The SUPERB Wagon will even get your seat for you. Each is equipped with electrically-adjustable driver seat with memory function — storing three separate positions of the seat and external mirrors. An electrically adjustable front passenger seat is available in the optional Comfort Pack. Combining our smart car with your smartphone was always going to be a good idea. SmartLink^^ smartphone connectivity with Apple CarPlay® & Android Auto™ seamlessly connects your smartphone to your SUPERB Wagon, mirroring your phone's display on the internal screen. So, whether you want to listen to music or receive turn-by-turn directions, you can do it all without touching your phone. You won’t be the first person to search for the parking brake. 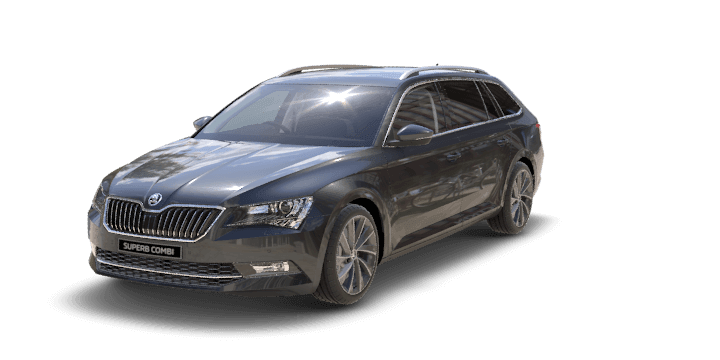 The new SUPERB Wagon is the first ŠKODA to feature an electronic version — increasing space, safety, and comfort. The Auto Hold function prevents the vehicle from rolling away at standstill or when pulling away, without you having to touch the brakes. All that important information, which used to be shown on your dashboard gauges, is now brought to life in a dynamic digital display. This driving data includes, speed and fuel readouts – along with more contemporary features, like driver assist and navigation tools. Virtual cockpit available as an option. Under the hood, we’ve over-delivered. The all-new generation of direct-injection turbocharged engines comprises TSI petrol or if you need all-wheel drive, there’s the top of the range 206Kw TSI petrol engine. The SUPERB Wagon is a bit of a control freak. The 206TSI is fitted with state-of-the-art all-wheel drive, guaranteeing optimal driving dynamics, high levels of active safety and economical fuel consumption. The only area we’ve cut back on. 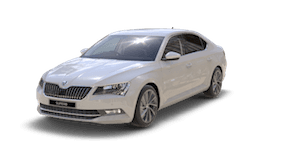 The fuel consumption and low CO2 emissions of the new SUPERB Wagon outperform its competitors. All engines feature Green Tech as standard, including a Start-Stop System and brake energy recovery, saving fuel in city driving.